Welcome to the Link Church in Dunfermline, Scotland! Through this site we hope to share with you something of who we are and what we do. We believe that the message of Jesus Christ is life changing and is 100% relevant to all that life brings today. You will find that we are a welcoming group of people, of all ages, who want to follow God in a whole hearted way. There are things going on seven days a week as we learn together, hang out together and serve our community together. We are having a great time twice a month at Messy Church! We have Messy Church @ The Link in Priory Lane on the last Saturday of the month, and Duloch Messy Church happens at Masterton Primary School in the middle of the month. This is a great way for families to do church together. It may not quite look like we expect church to.... lots more paints and glue and yep...... MESS! Don't make dinner plans, we eat together too! 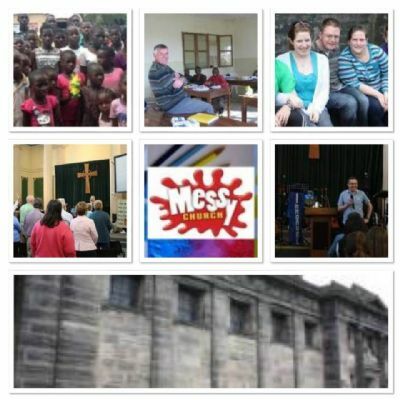 Messy Church @ The Link will be back on Saturday 27th April! Duloch Messy Church will be back on Saturday 11th May at 10.45 am. Join us for Breakfast Church which takes place once a month in Priory Lane. Breakfast is served from 9.45 am followed at around 10.30 am by a more informal service with activities for children. The next Breakfast Church will be on Sunday 19th May. A number of our members sponsor orphaned children in Zimbabwe to enable them to attend school. More than 40 children are now going to primary or secondary school as a result of this sponsorship programme. You can read more about it here.